At the weekend, spoiltpig were happy to provide holidaycottages.co.uk with some of our delicious bacon for the food bloggers they were hosting to promote local food and drink. Here’s what Emma from the team had to say about the weekend. Travelling from as far as Kent, London and even Manchester, 12 bloggers descended on Dorset to learn more about what Dorset producers have to offer in terms of locally produced goods. We provided a beautiful setting for them to stay but the real gems were the partners who provided a host of goodies for the bloggers to try out during their stay. The weather was on our side and everyone set off for a jump on the trampoline and a game of Badminton when they arrived. After an active afternoon we had planned a delicious three course dinner to see in our first night in Dorset. After a quiet and relaxing evening (aside from the trampolining!) the bloggers decided a leisurely lie in and breakfast was on the cards. 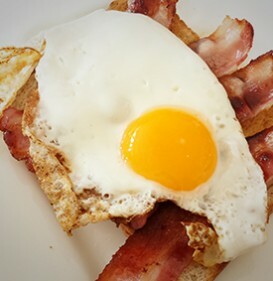 Denhay Farms had provided a selection of local goods to go with the spoiltpig bacon, from local free range eggs to farmhouse butter and apple juice. The bloggers cooked up a storm in the kitchen and all were grateful for the delicious cooked breakfast to start their first full day in Dorset. The rest of the weekend we continued to provide a number of delicious Dorset meals, all using local suppliers, companies, and services to ensure an authentic Dorset break. They even had enough bacon, eggs and vegetables from the weekend to cook up a bubble and squeak hash for the morning of departure when they all had long journeys home! Thank you all!